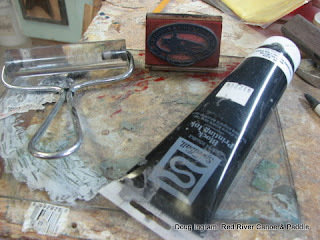 I use a custom made rubber stamp to put the logo onto the bow deck of the canoe. To do a clean job it is important to use a print making ink, not the kind that is usually used with rubber stamps. Also, you need to use a printmaking brayer (roller) to apply the ink to the stamp so that it is only on the design of the stamp. If you just dab the stamp into the ink it will smear into the hollowed out areas and make a mess when you apply it. 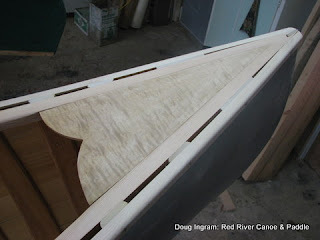 Bow deck prior to the logo. 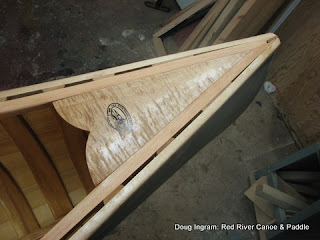 Bow deck with the logo and first coat of varnish.